To claim this profile, please confirm you are Nathan Suliguin. To follow this profile, please let us know your relationship to Nathan Suliguin. The Dougherty Valley varsity lacrosse team lost Friday's home conference game against Monte Vista (Danville, CA) by a score of 17-6. RESULTWin Boys varsity lacrosse vs. Dublin. The Dougherty Valley varsity lacrosse team won Tuesday's home conference game against rival school Dublin (CA) by a score of 11-5. RESULTLoss Boys varsity lacrosse @ Amador Valley. The Dougherty Valley varsity lacrosse team lost Friday's away conference game against Amador Valley (Pleasanton, CA) by a score of 17-6. RESULTLoss Boys varsity lacrosse vs. CVC. The Dougherty Valley varsity lacrosse team lost Tuesday's home non-conference game against Clayton Valley Charter (Concord, CA) by a score of 9-7. RESULTWin Boys varsity lacrosse @ Livermore. The Dougherty Valley varsity lacrosse team won Friday's away conference game against Livermore (CA) by a score of 16-13. RESULTWin Boys varsity lacrosse @ College Park. The Dougherty Valley varsity lacrosse team won Tuesday's away conference game against College Park (Pleasant Hill, CA) by a score of 13-12. Nathan has been added to the Dougherty Valley football roster. The Dougherty Valley varsity lacrosse team lost Friday's away conference game against Foothill (Pleasanton, CA) by a score of 17-5. RESULTWin Boys varsity lacrosse vs. Miramonte. The Dougherty Valley varsity lacrosse team won Tuesday's home non-conference game against Miramonte (Orinda, CA) by a score of 12-11. RESULTWin Boys varsity lacrosse vs. Granada. The Dougherty Valley varsity lacrosse team won Friday's home conference game against Granada (Livermore, CA) by a score of 9-3. RESULTLoss Boys varsity lacrosse vs. Foothill. The Dougherty Valley varsity lacrosse team lost Tuesday's home conference game against Foothill (Pleasanton, CA) by a score of 14-7. RESULTLoss Boys varsity lacrosse @ San Ramon Valley. The Dougherty Valley varsity lacrosse team lost Friday's away conference game against San Ramon Valley (Danville, CA) by a score of 17-3. RESULTLoss Boys varsity lacrosse vs. De La Salle. The Dougherty Valley varsity lacrosse team lost Friday's home conference game against De La Salle (Concord, CA) by a score of 9-2. The Dougherty Valley varsity lacrosse team won Tuesday's home non-conference game against Lincoln (Stockton, CA) by a score of 22-4. RESULTWin Boys varsity lacrosse @ Acalanes. The Dougherty Valley varsity lacrosse team won Wednesday's away non-conference game against Acalanes (Lafayette, CA) by a score of 9-6. RESULTWin Boys varsity lacrosse @ Las Lomas. The Dougherty Valley varsity lacrosse team won Tuesday's away non-conference game against Las Lomas (Walnut Creek, CA) by a score of 15-9. Nathan has been added to the Dougherty Valley lacrosse roster. RESULTLoss Varsity football @ San Leandro. 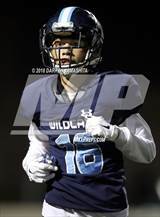 The Dougherty Valley varsity football team lost Saturday's away playoff game against San Leandro (CA) by a score of 24-21. This game is part of the "NCS/Les Schwab Tires Football Championships - Division 1" tournament. Nathan had 4 photos tagged from the game against Dublin.